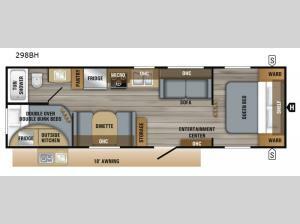 This Jayco Jay Flight SLX 8 298BH features a rear set of double bunk beds that your kiddos are sure to love and you will love having your own front private bedroom, when you draw the privacy curtains! The chef of your group will also love choosing whether to cook indoors or outdoors at the outdoor kitchen. There is even a 18' power awning to keep you protected from getting a sunburn, and LED lights to highlight your nights. There are plenty of storage areas inside between the overhead cabinets and closets, plus there is an exterior storage area that is easy to access! With any Jayco Jay Flight SLX 8 you will appreciate the 8-foot wide body, the reliability of the American-made Goodyear tires, and the handy Keyed-Alike entrance, plus baggage doors for protection on the road. You will also appreciate the spacious exterior storage for you to easily access your camping gear. Inside you will find modern kitchen appliances including a three burner range with a 9,000 BTU Super Burner and piezo igniter, a Norcold refrigerator, and a microwave oven. In every model, there is a queen Simmons mattress to re-charge for your next adventurous day, and there is also a bathroom skylight to let in some natural lighting. Come see which model fits your lifestyle the best!